Published: Aug. 18, 2018 at 06:43 p.m.
Oakland Raiders linebacker James Cowser intercepts Los Angeles Rams quarterback Brandon Allen's pass. 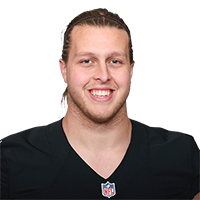 Published: Sept. 24, 2017 at 11:03 p.m.
Oakland Raiders linebacker Cory James forces fumble and teammate James Cowser recovers. Published: Dec. 8, 2016 at 08:36 p.m.
Kansas City Chiefs wide receiver Tyreek Hill muffs the punt and the Oakland Raiders recover.